Hi guys. I have some exciting stuff to share today...it's a LIMITED EDITION, Black Friday-themed box with exclusive releases by Glisten & Glow, DIFFERENT dimension, Cupcake Polish and NailVinyls. I got to meet each one of these gals this past summer (see this post) at Cosmoprof NA. Such a fun bunch of gals and a cool idea for a collaboration! The box includes three exclusive holographic polishes and a set of holo nail decals. It will be available one week from today (Friday, 28 November 2014) at 12:01am EST and 1pm EST. Store links are listed at the end of this post. Let's get to the polish! Glisten & Glow First in Line! 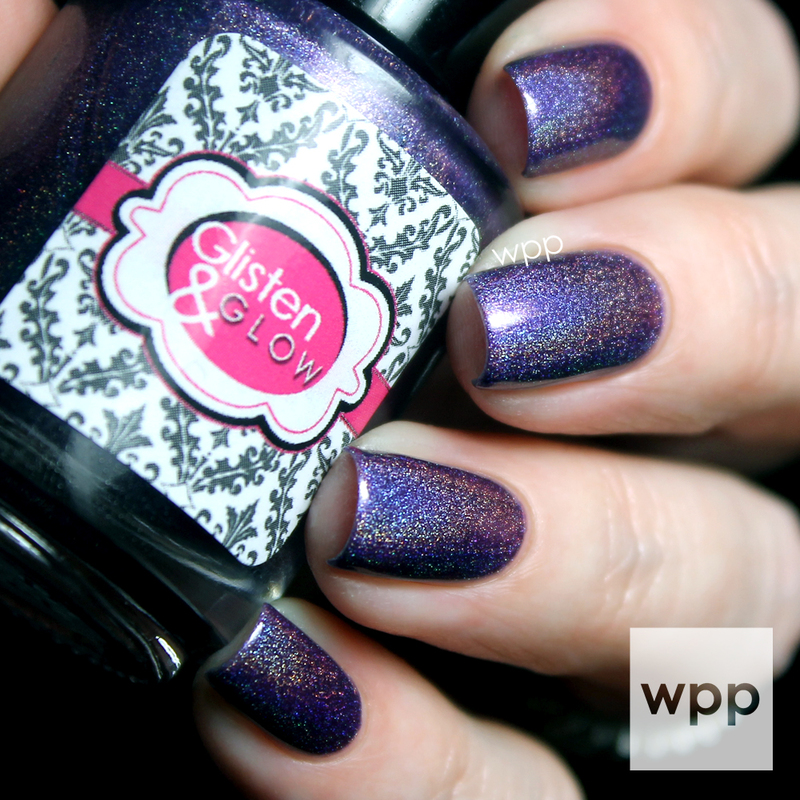 is a strong, deep purple holo. The formula was really nice and covered easily in two coats. Check out that rainbowiness! 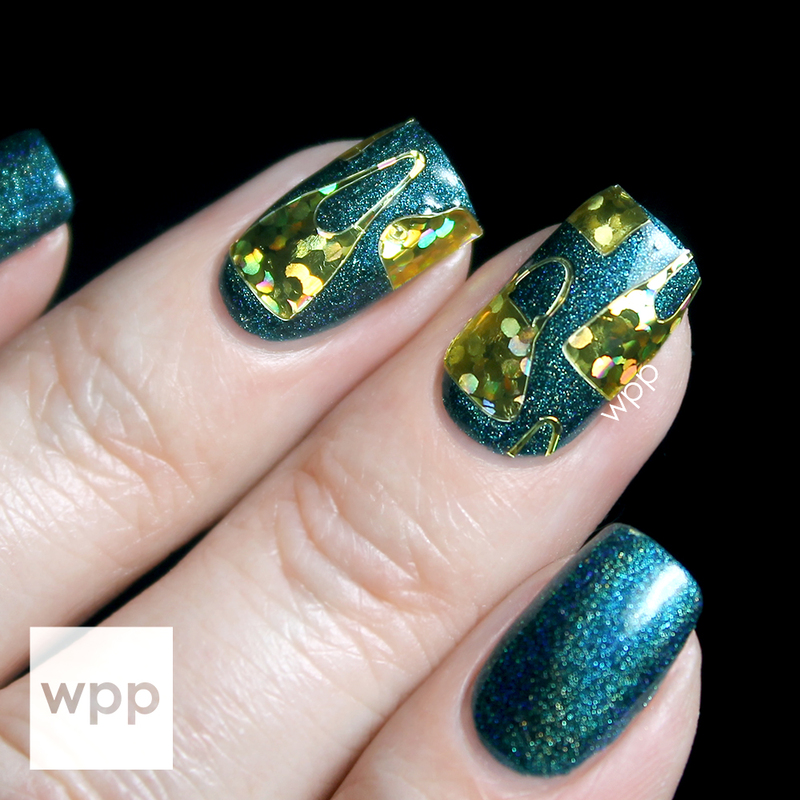 Using the NailVinyl holographic nail decals, I created a shoe-themed pattern on my middle and ring fingers. The decals are super simple to apply. If you wait until your polish is completely dry, then you have the option to re-position them, if needed. My nails are quite curved from side to side, so I placed them on wet topcoat to keep the edges down. When finished, seal them with your favorite topcoat. I used G&G HK Girl. Unfortunately, I didn't have access to any sunlight when I swatched these (boo! 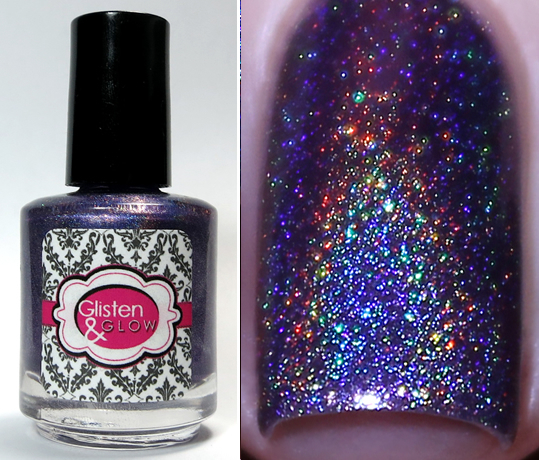 ), so I took a shot in the dark using the flash so you could see the beautiful holo effect. First in Line's holo effect is obvious, even in low light. Next up is Up All Night from DIFFERENT dimension. 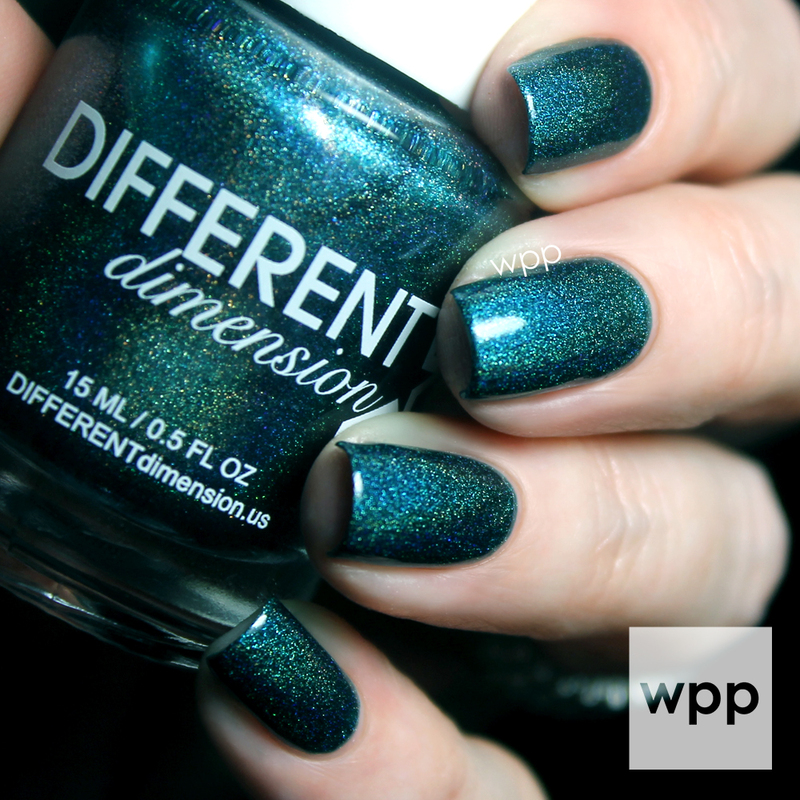 This deep green-blue holo is gorgeous! I'm totally digging this color! My swatch is two coats. To snazz-up Up All Night, I did two handbag themed nails. How fun are these bags?! 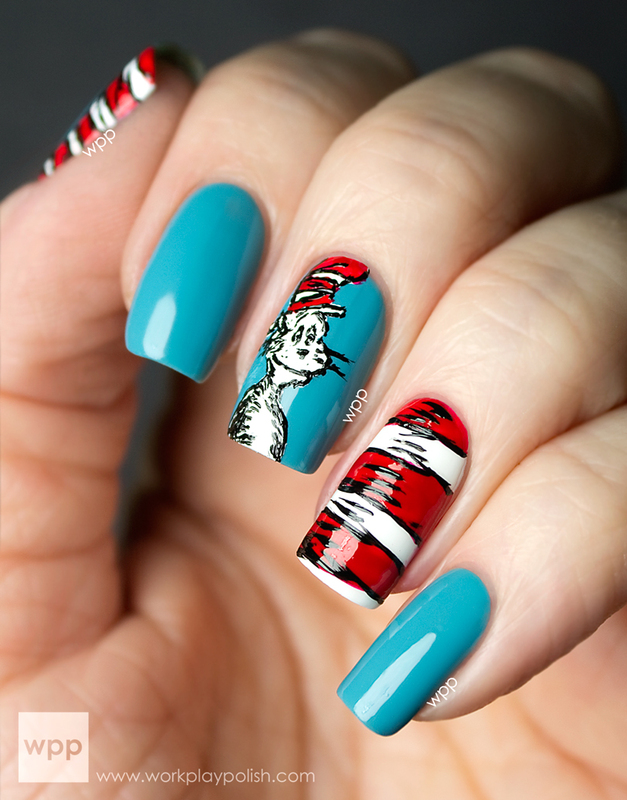 When I created these designs, I laid all of the decals onto the nails and trimmed the excess with small cuticle scissors. And doesn't the gold look great against the green? Here's a bottle shot and a pic with flash. It glows! 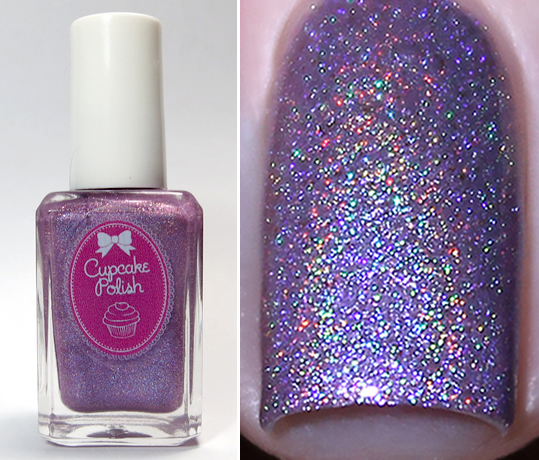 The third polish is Trampled by a Shopping Cart by Cupcake Polish. I LOL'd at this name. 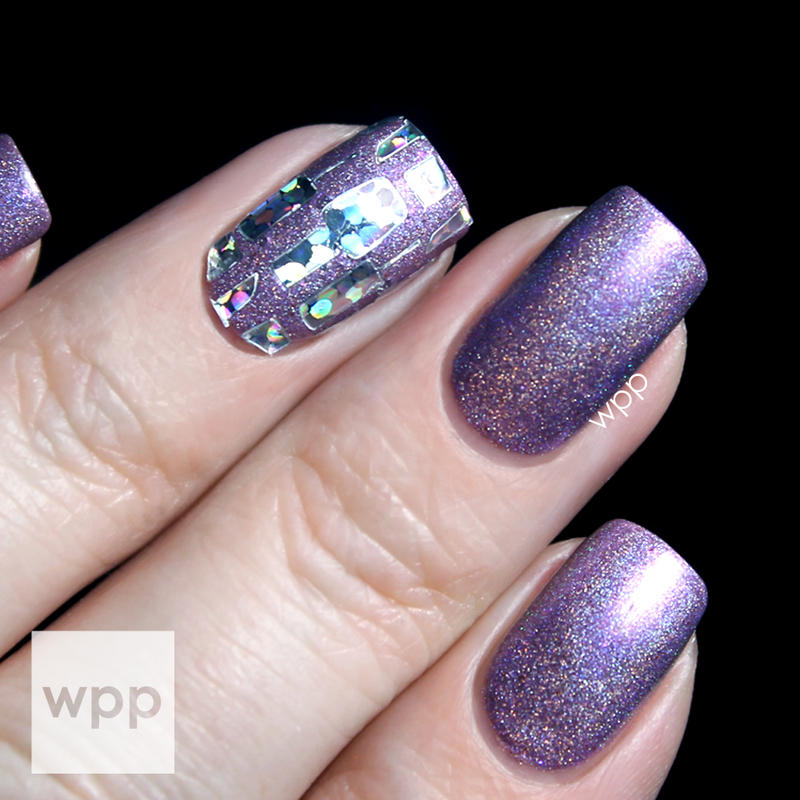 This is a lavender holo with a really beautiful raspberry shimmer that you can't really see in my pics. It's gorgeous. I used two easy coats. I blinged out this polish with a pattern of nail polish and lipstick decals on an accent nail. See how there are separate decals for polish bottles and brushes? Super cute! Wow. Check this out with the flash. The color is much more purple on the nail than it looks in the bottle, I think. And here is the complete set of shopping themed nail decals from NailVinyls. In addition to what I showed you above, it also includes perfumes, dollar signs and price tags. 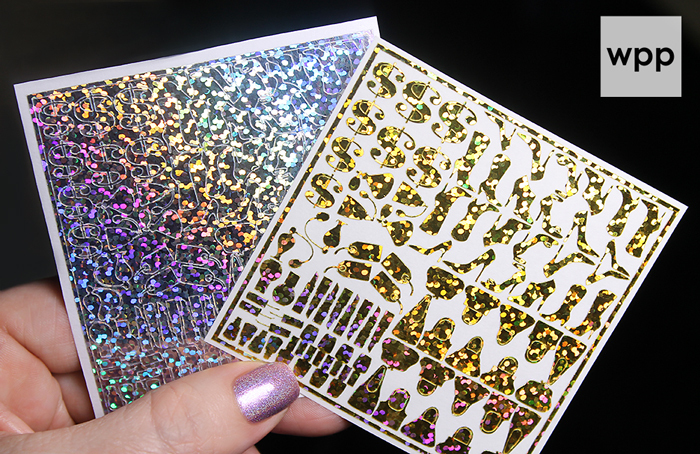 You get two full sheets, holo gold and holo silver. 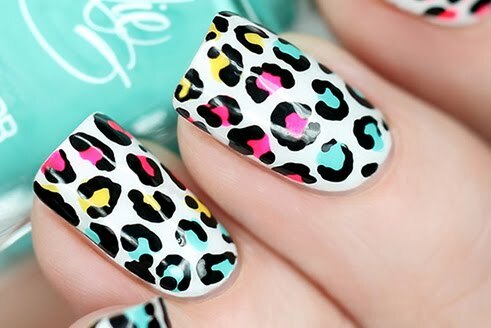 Such an easy way to turn a mani into nail art! I love collaborations and this one is no exception. 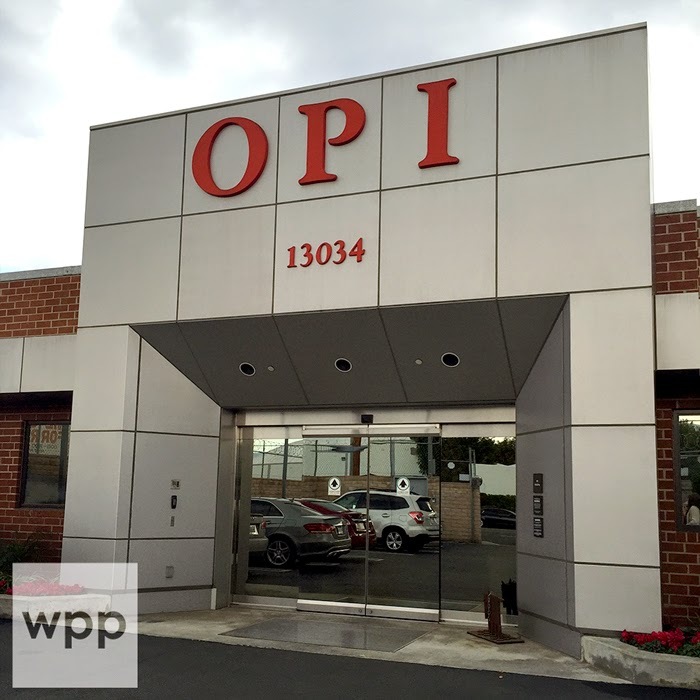 The theme is super fun, the polishes are beautiful, and the decals add some bling. This box would make a great gift. It will be available next week ((Friday, 28 November 2014) at 12:01am EST and 1pm EST for $40 at each indie's store. Links to the individual shops and instagrams are below!